So what’s the scoop on Methionine? Are we stressed yet? Yes it matters! Small grain harvest is coming! Over the past 20 years, Mary-Howell and Klaas Martens have written a number of more technical articles for Acres USA, the Rodale Institutes New Farm Magazine, Organic Broadcaster and others. Here are some of them. Mary-Howell and Klaas Martens wrote a monthly column for the Rodale institutes New Farm online magazine for several years. During this time, our family was growing, with children in elementary and middle school, so the columns were truly a monthly Letter from New York, with seasonal musings on organic farming, day-to-day life on the farm, American agriculture, community, philosophy and family. “I wish you didn’t have to do that!” I was standing by the kitchen door, several months pregnant with our second child, as I watched my husband, Klaas, leave the house dressed for battle in his white Tyvek ‘zoot suit’ and special green plastic gloves, ready to attack and subdue the enemy. “Me too, but what choice do we have?” We were a young couple, just starting our own farm. Switching to organic farming was risky and unknown, but now, 10 years later, we know we made the right choice. As harvest finishes, many of us are facing grain bins and checkbooks that are not as full as we had anticipated when we planted those seeds so hopefully last spring. It has been yet another tough year for farmers. Yet despite that, it is still a privilege, shared by an increasingly smaller number, to harvest our own crops, to see and hold the tangible completion of the year, of our hard work and our skill. As Thanksgiving comes, it is also a privilege to understand the sense of urgency and relief expressed in the hymn, all is safely gathered in, ere the winter storms begin. 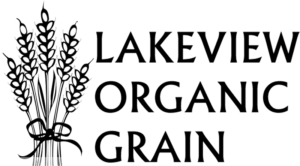 Six organic grain growers formed ‘New York Certified Organic’ about 10 years ago as an organic certification chapter. They could have been protective of their market advantage, refusing to teach others how to farm organically, but instead they shared their experiences freely with all who came to the meetings. Amazingly, as we shared, our markets and opportunities grew! The meetings continue to be a place where we gather as friends, learning from each other, discussing our farm successes and failures. At the December meeting, we had the privilege of listening to Dr. Bill Liebhardt who shared valuable insights for improving organic weed control. As the New Year begins, we take stock on the previous year, considering the value of good record keeping, honest accounting of cost of production, and we take a good hard look at our decisions and their outcomes for the past season. Using the discipline of this review, we try to make better plans for the coming year, evaluating soil fertility, interpreting soil tests, and reflecting on what really defines success on an organic farm and family. Do we grow what we want to grow and then try to find markets, or do we grow what the market wants? Do we choose crops best suited to our farms, or do we choose crops that we think will make us the most money? Crop rotation planning must take many factors into account, the agronomic, the economic, and the “what will work on my farm, with my equipment, labor, and time?” Too often we plan our crop rotations based on what works for someone else. With so many options for profitable organic crops, we have a very broad palette of choices to choose what works best for us! Over the past 5 years, our cup has been filled with so many wonderful people. People who have sat at our table, shared our food, our children, and our home, and who have shared with us. Those we have met briefly, those we have had the privilege to get to know well, and many email and phone friends we have never actually met face to face. For the most part, these folks are not the names of the organic community – they are simply good organic farmers, researchers, educators, inspectors and processors who are trying their best to do a good job and help others. This is indeed the true wealth in the organic community – the people! Organic farming is not ‘going back’ to the old way of farming – NOT AT ALL! Instead, organic farming is precision farming at its finest, not resorting on chemical or genetic crutches, but instead relying on the intelligence and observational skills of the farmer, the best designed equipment, close attention to timing, a high degree of management and recognition of valuable opportunities when they come along. Precision farming also includes taking care of ourselves, and of others, to build healthy families and communities. In the middle of another tough, discouraging season, the relentless rain disrupting our cropping plans, the stress on both crops and people is nearly intolerable. We write about farm stress, family, decision making when there seems to be no good choices, resilience, community and hope. This was a difficult column to write, but ultimately it became a letter of love and hope (to ourselves). A family vacation to the Outer Banks of North Carolina leads to lyrical musing about the unseen life beneath our feet, on grains of sand, and in a handful of soil, and how this multitude of microscopic life affects our ability to farm and live on this planet. The article concludes with discussion about Hurricane Isabel, which ripped through the Outer Banks shortly after we left, and how lessons learned from that experience can teach us a lot about modern American agriculture. As the USDA National Organic Program comes into full effect, many long-time organic farmers are chaffing under the new rules and complicated new bureaucracy. To us, organic certification is more a discipline, teaching and guiding us to be better farmers, and inspiring us learn from visionaries who have been leaders in the organic movement for many years. How did we get here? It is important to know and to appreciate! Is it perfect? No, of course not, but it is still our responsibility to make it better! As the season winds down, we celebrate the bittersweet contrasts of light and dark, warm and cold, the success and challenges, the long, hard days of summer and the warm inside family-time of winter. It is the balance of all of these things that brings perspective to our farm and in our family. As we take stock after another difficult growing season, we begin to plan for the next year. If the initial design of products or systems largely define the outcomes, as architect Bill McDonough tells us, what does the current design of American agriculture dictate? What are the costs and sacrifices required to achieve these goals? How can we organic farmers do things better? This article was written as a painful rant in response to the untimely death of Mary-Howells cousin from occupationally-induced cancer, asking the critical question – what point does the cost of ‘progress’ become simply too high? Economists tell us that there are only 3 honest ways to make more money in business – increasing volume, increasing price, or decreasing costs. After two difficult years, we look ahead to 2004, trying to practice practical risk management, improving our bottom lines by making better choices. Winter is a good time to consider our business planning, visit with financial advisors, and spend time with our families. We conclude with a broad sweep of New Year’s Resolutions – hopefully we’ll actually keep some of them! What we do believe organic agriculture should accomplish, if indeed we cantaccomplish everything? Should we focus on environmental, social, and health benefits, or should we focus on food purity? This article is pure philosophy: as the organic industry matures, how should ‘organic agriculture’ be defined, and what issues should be prioritized? As we start the new season, it is time for organic farmers to consider a different approach to decision making! Instead of reacting to problems and seeking band-aids for symptoms, we instead need to “think upstream”, identifying causes of problems and changing our management to avoid them. Creating a healthy, well-balanced soil is more important than finding a chemical that temporarily addresses the symptom. Identifying and changing conditions that favor certain weeds simplifies our weed control. Creating opportunities for our children to take responsibility and gain experience is better than handing them gifts. We can do better! A challenge, half in jest, from a new friend: “franchise the design and success of your farm onto my new organic farm.” Never ones to shrink from a challenge, we attempt to define the factors that have led to success on our organic farm, from the necessary features of a farm manager, to wise soil, crop and equipment choices, to administrative and certification management. We end with a detailed list of further resources to help new organic farmers find answers and support. This lengthy project was published in two parts. A season like this shows clearly how difficult and stressful it can be to make ‘right’ decisions when confronted with complex and unpredictable situations. The desired crop rotations, tillage plans, timing for cultivation, and ideal % grain moisture at harvest just go right out the window when each passes and we can do nothing in the fields. Many of us suffer from an either/or mentality when it comes to our decisions. We assume that either we have to be completely competent at all times, or we automatically conclude that we are hopelessly incompetent. Probably the truth is somewhere in between – that we’reusually are good at most things, but occasionally we do something that is astonishingly stupid. In a tough year especially, it is important to celebrate our successes because without a doubt, they do exist! Standing out in your field, surrounded by those amber waves of grain or rustling corn stalks, it is hard to imagine that the value of that beautiful grain could be spoiled by mishandling during harvest, transport, and storage. Unfortunately, growing the crop is only half the battle, though it is the part that farmers tend to focus most on. Now comes the second half of the challenge – maintaining that fine grain quality until sale. In this article, we consider many of the things that can go wrong – or right – during harvest and storage that can affect organic grain quality. cookbooks were considered appropriate leisure reading, where Julia Child joined us regularly during dinner from her TV kitchen, and where the women find much purpose and pleasure in feeding people and showing off their culinary skills. But, being a Foodie today is more than just about feeding our families. This article discusses food issues and malnutrition, in both developing and developed countries. Even in societies of plenty, nutrient content of food has significantly declined over the past 50 years, with profound health implications. Organic farming, with its emphasis on soil health, has the potential to restore nutritional value and food security.